The primary source of this interesting surname is the Norman French male given name "Arnaut, Arnott, (H)ernaut", itself coming from the Old German "Arnald, Arnold, Arnolt", a compound of the elements "arn", eagle, and "wald", rule. One Rogerus filius (son of) Ernaldi was recorded in the Domesday Book of 1086, and an Hernaldus de Bolonia was noted in the Red Book of the Exchequer, dated 1212. Pre 7th Century Anglo-Saxon and Old Norse baptismal names were usually distinctive compounds whose elements were often associated with the Gods of Fire, Water or War, or composed of disparate elements. The surname from this source was first recorded towards the end of the 12th Century (see below), and further early examples include: Lecia Arnet (Cambridgeshire, 1273), and William Arnold (Suffolk, 1277). In the modern idiom the name has several spelling variations ranging from Arnald, Arnaud and Arnot(t), to Harnett and Harnott. 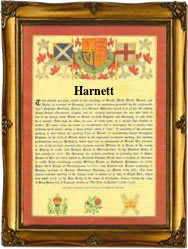 On February 4th 1639, Emblem Harnett and John Hobson were married at Westminster, London. Harnett may also be of Irish origin, and an Anglicized form of the Old Gaelic "O'hAirtneada", descendant of Artnead, a male given name from the Old Irish "art", a bear. The name is mainly found now, as in medieval times, in south-west Munster. On July 25th 1799, Daniel Harnett and Mary Rourke were married at Killarney, County Kerry. The first recorded spelling of the family name is shown to be that of Puntius Arnaldi, which was dated 1196, in the "Pipe Rolls of Devonshire", during the reign of King Richard 1, known as "Richard the Lionheart", 1189 - 1199. Surnames became necessary when governments introduced personal taxation. In England this was known as Poll Tax. Throughout the centuries, surnames in every country have continued to "develop" often leading to astonishing variants of the original spelling.